Hurricane Lane, a Category 3 hurricane, is currently on track to pass just to the south and west of Hawaii, bringing torrential rainfall and high winds to the islands. If Hurricane Lane makes landfall, it would be the first major hurricane to make landfall in Hawaii in 26 years. To help promote understanding of potential energy-related storm effects, EIA maintains an energy disruptions map that displays energy infrastructure and real-time storm information. Effects from Hurricane Lane have already been felt in Hawaii, as more than two feet of rain had fallen on parts of the Big Island as of Friday morning. The hurricane is expected to make its closest approach to the islands of Maui and Oahu Friday night and into Saturday morning. The governor of Hawaii declared a state of emergency on Tuesday, August 21, in advance of the storm. Hawaii imports nearly all of the energy it consumes, mostly as petroleum. About half of Hawaii’s total energy demand is accounted for by the transportation sector, led by jet fuel use. 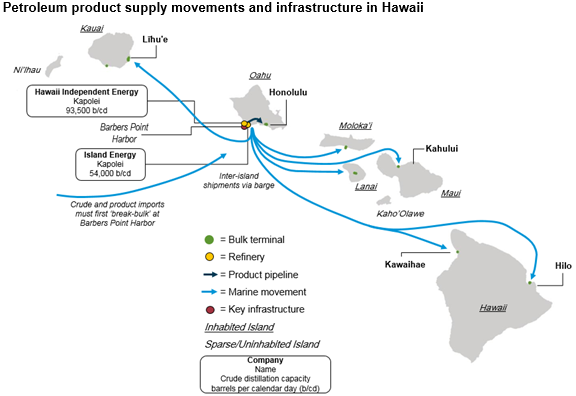 Two operating refineries in Hawaii, both located on the island of Oahu, have the capacity to process 147,500 barrels of crude oil per calendar day (b/cd), based on data in EIA’s Refinery Capacity Report. The Par Petroleum Kapolei refinery, also known as Hawaii Independent Energy, has an atmospheric crude distillation capacity of 93,500 b/cd and processes a mix of sweet and moderately heavy crude oils into jet fuel, diesel fuel, and other products. The Island Energy Kapolei refinery, with an atmospheric distillation unit capacity of 54,000 b/cd, refines light, low-sulfur crude oil into motor gasoline, distillate fuel, and jet fuel. These refineries also produce petroleum fuels used in electric power generation. 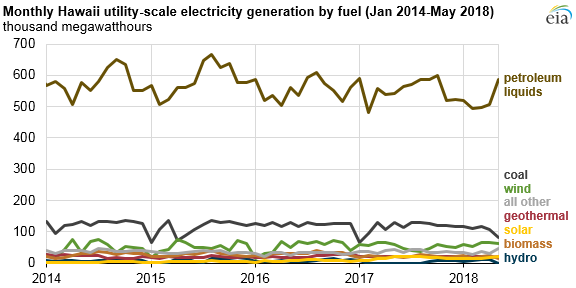 More than 68% of Hawaii’s utility-scale electricity generation is from petroleum-fired power plants, with coal and wind making up another 14% and 7%, respectively. Hawaii is one of just seven states with utility-scale geothermal generation, but geothermal generation on the Big Island has been shut down since May because of the eruption of the Kilauea volcano. Hawaii has seven wind energy power plants with a combined electricity generating capacity of 206 megawatts on the islands of Oahu, Maui, and the Big Island. Based on data in EIA’s annual survey of electric generators, these seven plants have 114 wind turbines ranging in height from 130 feet to 330 feet. Hawaii has no offshore wind turbines. Small-scale distributed solar photovoltaic systems generated on average about 81,000 megawatthours each month in 2017. EIA’s energy disruptions map displays key layers of energy infrastructure, including power plants and major electric transmission lines, and real-time storm information from the National Weather Service. The web page also has links to the U.S. Department of Energy’s Emergency Situation Reports and other websites that provide updates on the effect of severe weather on energy infrastructure.